I wrote it in my new 2018 day-planner, the one with all the space for goals, plans, and action steps. I jotted it down on my desk calendar at work. I scribbled it next to a little circle on my to-do list notepad. And I still forgot to bring the ‘thank you’ card to work for my co-worker this week. As a result, frustration came in like an overpowering wave. Frustration with myself. How could I be so forgetful? We’ve been in a busier-than-usual season at our house. The list of things that must get done keeps growing, and I find myself putting off everything until the weekend. There’s just one problem with scheduling everything on Saturday. Saturday comes, and I’m too tired to tackle the list. So another week passes, and next Saturday’s list is even longer. And so on. And so on. In those times, I feel like chaos has taken over. My mind struggles to focus on just one thing, much less a never-ending list of things that ‘have to be done this week’. It’s hard to feel focused when chaos surrounds us, but God gives encouraging direction in David’s instructions to Solomon regarding the building of the temple. When God chose Solomon to complete the job, David shared this with his son as he commissioned him to begin the work God called him to do. As God’s children, we are commissioned and called to worship and serve Him. In this verse, we learn a valuable detail concerning these things. We are to worship and serve with a whole heart and a willing mind. David continues on from there with a reminder that God knows our thoughts and plans. And thankfully, His plans for us are better than our own. Can I admit something to you? This morning when I woke up and turned on my tablet to read my daily Bible reading plan, I noticed something. In the midst of a chaotic week, I’d rushed through my morning routine and hadn’t finished a single day’s reading. Not. Even. One. So I guess you could say I didn’t offer my whole heart or a willing mind this week. I forged my own plans. I let chaos cause me to lose focus. But David’s inspiring speech to Solomon gives us hope today. Putting God first in our hearts and minds will keep us focused on things that matter. 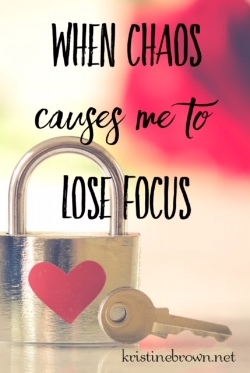 Speaking of focus, will you excuse me for a moment? I have a thank you card to drop in the mail.